Hi everyone! Today we are joining our friends in the Lighthouses Around the World Blog Hop for National Lighthouse Day. We searched our archives and found a few lighthouse pictures we could share. 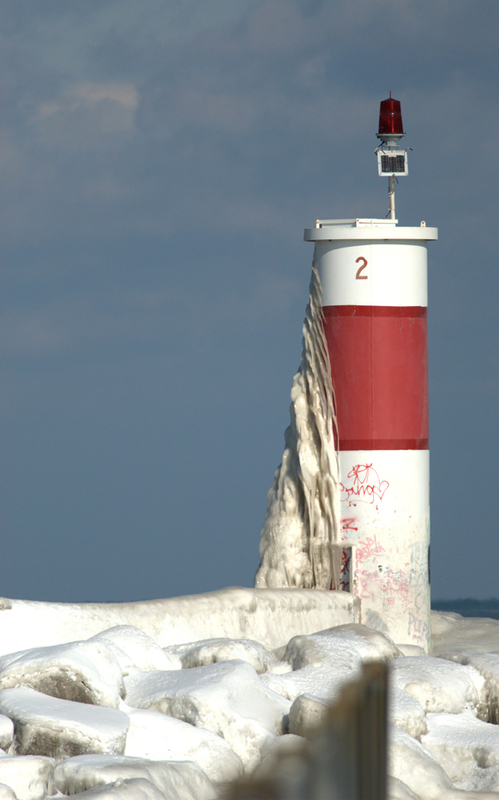 Living along the south shore of Lake Ontario there are a few lighthouses around. Many of our local lighthouses have been turned into historical sites and museums. Sodus Bay is the largest natural harbor on Lake Ontario and is located about 38 miles east of Rochester, New York. The original lighthouse at this location was erected in the late 1850’s. 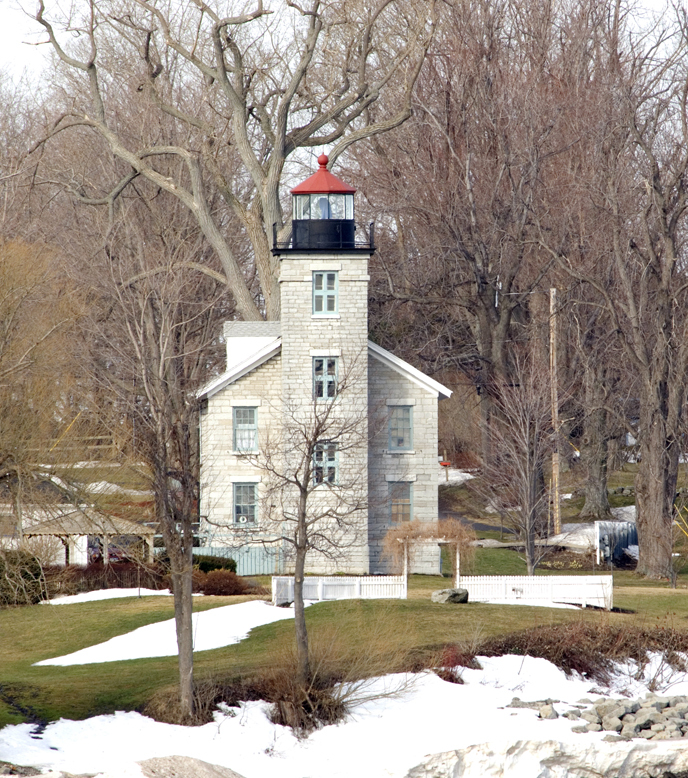 This lighthouse is no longer operational but is used as a museum and is operated by the Sodus Bay Historical Society. You can read more about the history of this lighthouse here. 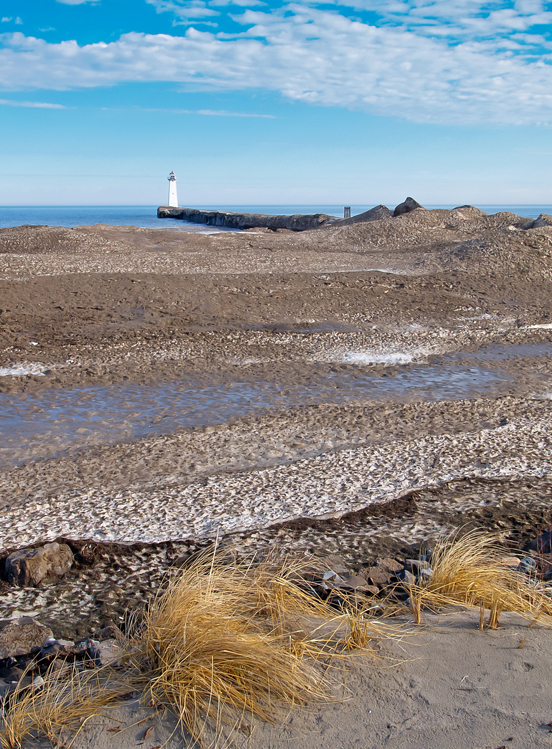 When piers were erected at the entrance of Sodus Bay the Outer Lighthouse was added to the end of one of the piers. The late winter shot above shows about 50 feet of dirty compacted snow that extends out from where the grasses are in the foreground of the picture. 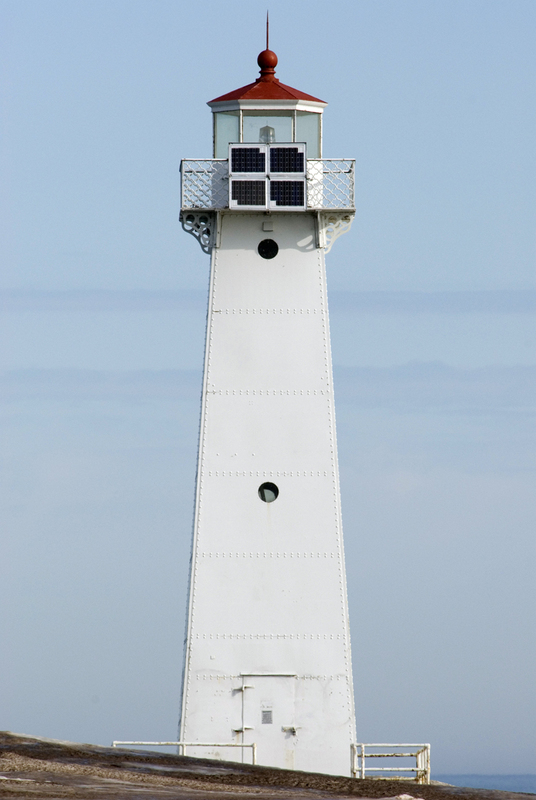 Below is a close up of the outer lighthouse. Closer to Rochester in Webster, NY there is another pier with a light tower on it. It may be difficult to see but at the end of this ice covered pier there is a light tower. Here is a closer view in color taken on the same day. Moving further west we will visit the Irondequoit Bay Outlet light tower. This light tower is on the end of the west side pier. I hope you’ve enjoyed seeing a few of the lighthouses and light towers along the southern shore of Lake Ontario near Rochester, NY. Gosh winter truly is winter in your part of the world isn’t it! Love the lighthouses – thanks for sharing. Wow – these are beautiful lighthouses not far from you! Thank you for joining our hop! 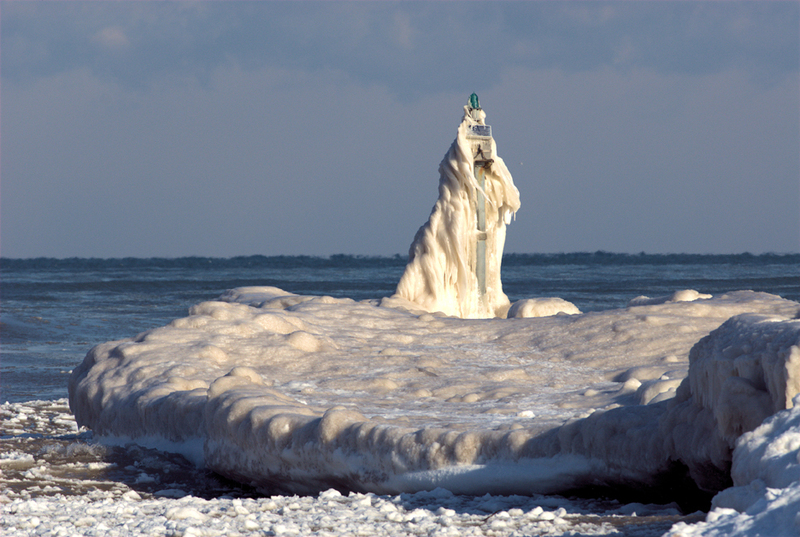 That snow-covered lighthouse is just unbelievable. And it’s the way it wraps around it. Almost sinister! 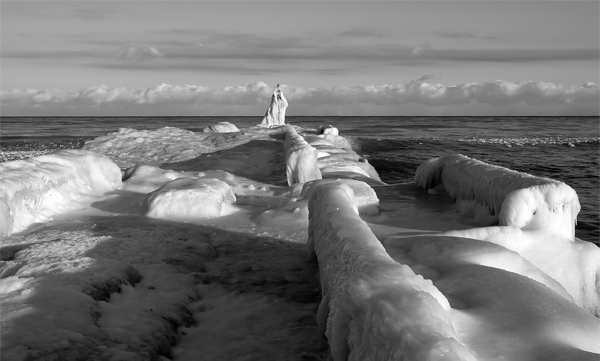 Whoa…those winter views are incredible! Ooooooo, that looks cold. Love the museum-lighthouse. So much character. We haven’t been up to Sodus in ages! Thanks for the great pictures. What great photos! We just LOVE the one covered in ice!!! on August 9, 2018 at 12:45 pm | Reply World Of Animals, Inc. Thanks for the wonderful share. We have been enjoying so much learning about all these beautiful lighthouses on different posts recently on Lighthouse Day. We love the amazing photos you shared and hope you are having a great day. WOW!!! Sorry we’re late getting here, but WOW! The snow makes these lighthouses even more beautiful! That piled up snow and ice! Goodness. Somehow I don’t even remember looking at this post in my e-mail. Amazing!